When I pull up to the remote drive-thru at the bank, if I dont get close enough to dent my side view mirror, then I cannot reach the little button to send the tube to the bank lady. I have designed The Michelangelo Button to help out those of us with short arms, or those of us who cant get the car close enough for one reason or another. It is a rubber hand of The Creation of Adam that protrudes out from the terminal. Just touching the fingertip activates the button and sends the tube flying up. I love the name and the notion, so a (+). Can you also have a FSM noodly appendage version? [marklar] Thanks! I had to look that one up and it's cool, so you could have any version you want. Thank you, too  as I'm just learning a tiny bit of photoshop and can now do stupid ideas with it. Wouldn't the button extender hit your side mirror? Or does the hand retract when not in use? 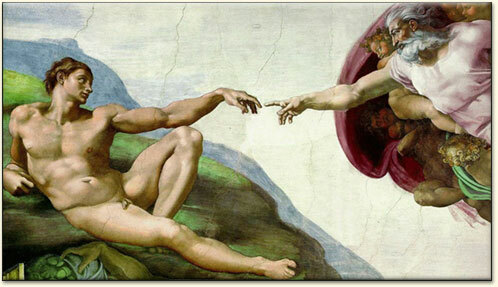 [xenzag] re the Michelangelo image in your second link - I'd always imagined god would be bigger than that, somehow. He looks bigger on TV. [Text] It's made of rubber, so it's OK to hit the side mirror. It's possible to make a retracting one, though. Love the link [imaginality]!